This post is for Nokia E7 Touch Screen Not Working problem solution. If your phone is having any kind of touch screen problem diagram below can be helpful. If your Nokia E7 Touch Screen stops working properly instantly clean the Touch Connector to make sure that moisture or carbon is not causing this trouble. If by any chance touch connector prints are busted, I have marked Nokia E7 Touch Ic Jumper points in the following diagram. 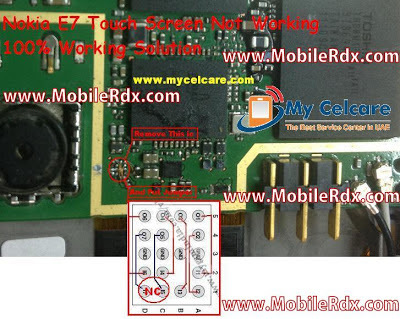 Here Are Nokia E7 Touch Screen Ic Jumper Ways Problem Solutions. Please Observe Carefully.